Australian War Memorial #P00554.006. Used by permission. Born into a military family but lacking the money for middle school, Adachi Hatazo attended the Tokyo Cadet Academy, where he was schooled both in strict discipline and the fine art of writing short verse (tanka). He was then admitted to the Military Academy, which was dominated by veterans of the bloody Russo-Japanese War, and characterized by a purely military curriculum and brutal discipline. He graduated in 1910 and served with the First Imperial Guards Regiment. Unlike many Army officers of his day, he avoided any involvement in the political intrigues that permeated Japan in the 1930s and was deeply devoted to his wife and family. Adachi graduated from the War College in 1922, but he saw no combat until the 1930's, when he served on the staff of Kwantung Army. He gained a reputation as a "soldier's general," though perhaps not in a sense immediately recognizable to Westerners. Witnessing the miserable living conditions of Japanese troops, he resolved to share their privations, rather than to ameliorate them. He drank heavily at gatherings of his officers, apparently so that all present could speak freely without loss of face. 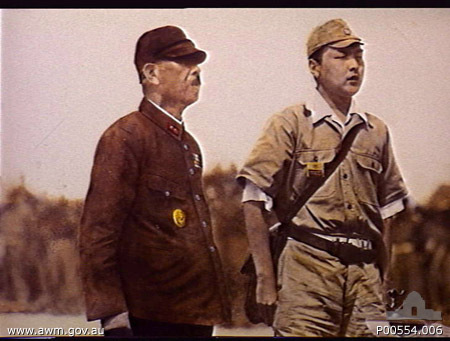 Adachi was given command of the newly organized 18 Army in the Solomons, New Guinea, and New Britain in November 1942, shortly after his wife's death. His headquarters joined 51 Division on a convoy from Rabaul to Lae that became the focus of the Battle of the Bismarck Sea (2 March 1943), where the destroyer carrying him and his staff was sunk. In New Guinea, Adachi faced a dilemma: If he dispersed his forces, he invited defeat in detail; if he concentrated, he risked being cut off by a leapfrog maneuver. Unknown to Adachi, his opponent, MacArthur, had access to Ultra decrypts that eliminated any possibility of the Japanese outguessing the Americans. MacArthur knew that the Japanese were weak at Hollandia and Aitape, and the Allied seizure of these bases in April 1944 left Adachi and most of 18 Army cut off in the jungle. With just two months of supplies, and no hope that Adachi's 55,000 troops could live off the land in a region that could barely support its 15,000 native civilians, Adachi resolved to attack the Allied beachhead at Aitape. The Japanese offensive began on 10 July. The Japanese were desperate and fought ferociously, but by 3 August the attack had failed. Of Adachi's original 140,000 men, barely 13,000 were still alive when the war ended. I have decided today to make a final farewell to those whom I love most. I felt it a great honor to have been appointed the commander in chief in November 1942, at a time when the issue of the day was to be settled, and posted to the point of strategic importance in order to ensure that the tide of war moved in our favor. I was thankful for that appointment. However, notwithstanding the fact that my officers and men did their best in the exceptional circumstances, surmounting all difficulties, and that my superiors gave the utmost assistance, the hoped-for end was not attained, because of my inability. Thus I paved the way for my country to be driven into the present predicament. The crime deserves death. During the past three years of operations more than 100,000 youthful and promising officers and men were lost and most of the died of malnutrition. When I think of this, I know not what apologies to make to His Majesty, the Emperor and I feel that I myself an overwhelmed with shame. Our Imperial country totters on the brink of disaster. I believe it is the natural path for our citizens and soldiers alike to continue fighting until the last drop of our blood is shed. I have demanded perseverance far exceeding the limit of man's endurance of my officers and men, who were exhausted and emaciated as a result of successive campaigns and for want of supplies. However, my officers and men all followed my orders in silence without grumbling, and, when exhausted, they succumbed to death just like flowers falling in the winds. God knows how I felt when I saw them dying, my bosom being filled with pity for them, though it was solely to their country that they dedicated their lives. At that time I made up my mind not to set foot on my country's soil again but to remain as a clod of earth in the Southern Seas with the 100,000 officers and men, even if a time should come when I would be able to return to my country in triumph. Adachi's words are a grim illustration of the Japanese Army's cult of death. After the war, Adachi was sentenced to life in prison for issuing an order encouraging the murder of captured Allied aviators, but committed suicide in 1947 after testifying on behalf of his subordinate officers.